Has it been a ridiculously long amount of time since my first post? Yes. Am I going to have to start eating a little less and writing a little more? Clearly. I love using an adverb as a sentence. 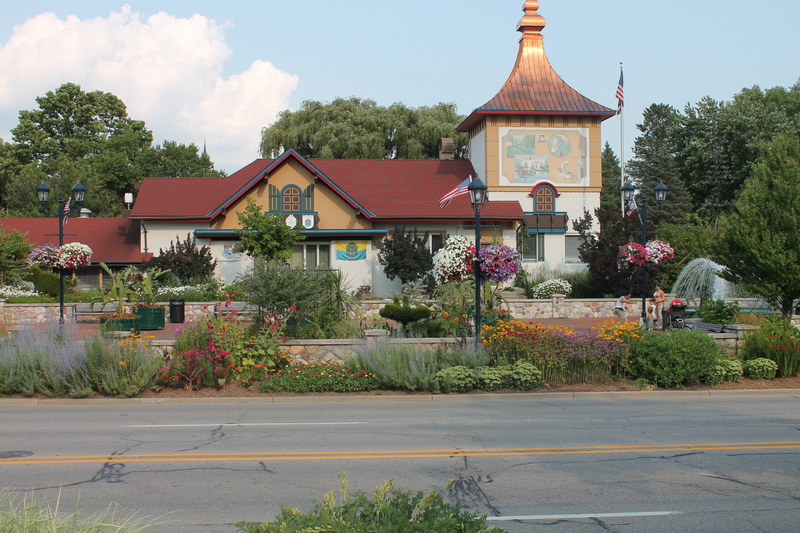 Frankenmuth is a wonderful little Michigan gem that you must experience for yourself. Maybe you have some preconceived notions about Frankenmuth that have kept you from visiting. Let me clear those up for you. “Isn’t that the Christmas store place? Is that all there is to do?” Yes, you will find Bronner’s CHRISTmas Wonderland in Frankenmuth. It is a ginormous store filled with every Christmas decoration, village, lawn ornament, and musical Santa you could imagine. No, it is not all there is to do. There is also – Grandpa Tiny’s Farm, Bavarian Inn Castle Shops, Bavarian Belle Riverboat,The Lager Mill, Michigan’s Military & Space Museum, Zehnder’s Splash Village, Riverplace Shops…yup, way more than the Christmas store. “Isn’t Frankemuth for old people” This, asked of me recently by an Ohioan, is just a dumb question. “Is there anything else to eat besides those famous chicken dinners?” Oh yeah. Tiffany’s kind of goes against the Frankemuthian grain. You won’t find a lot of German-themed fare here. Tiffany’s serves pastas and pizzas that are way above par. They also offer a lot of seafood dishes including the Giant Juicy Clam Strips (seriously, the biggest clam strips I have ever seen) and Walleye fillet, both enjoyed thoroughly by my dining companions. They were nice enough to give me a bite (P.S. if you go to dinner with me, I’m gonna need a bite) and those dishes certainly satisfied. Their pastas, pizza doughs, and sauces are all made by hand fresh each day. 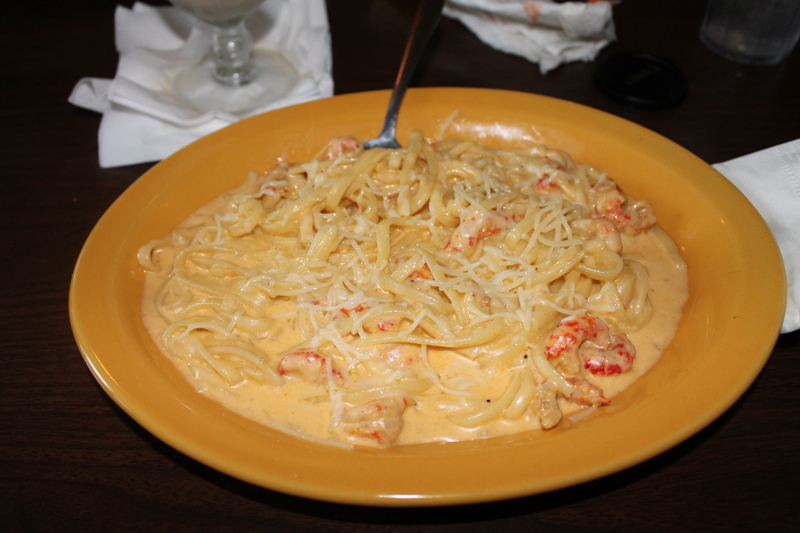 I chose the Bourbon Street Pasta which had crawfish and Cajun seasoning tossed in a creamy sauce with linguini. It was perfectly spicy and creamy – I love a rich seafood pasta. 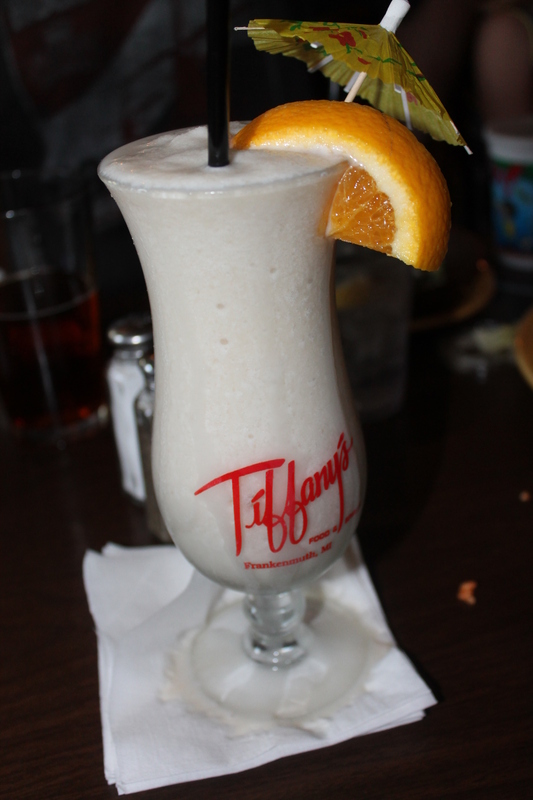 Tiffany’s also offers various specialty spirits. Many of them come with your own Tiffany’s glass to take home! If you haven’t done the Bavarian Inn or Zehnder’s chicken dinner thing, you probably should. It’s a whole comfort food, costumed waitress, family-style, weird bean salad that no one ever eats, Frankenmuth-tastic ordeal. If you want something else, definitely stop at Tiffany’s. And tell them I sent you. That won’t mean anything to them or get you any sort of special deal, but it will feel cool. Trust me.